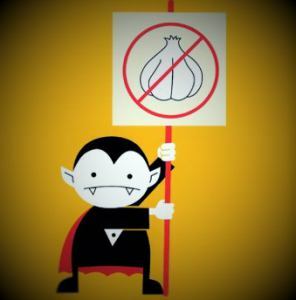 Garlic provides many other health benefits than keeping vampires away. It can help prevent the common cold, lower blood pressure, boost the immune system. Perhaps he was thinking of Garlic when those words came into being. Yet how true the statement of his is, especially when referring to the many health benefits that Garlic has to offer and not just in the culinary department. What better medicine to have than that of Garlic and with the many proven health benefits, it is no wonder that this humble bulb is medicine for the body. Garlic is a plant from the Allium family. It is made of separate cloves, which as a whole, becomes the Garlic bulb. Some of the family members are Leeks, Onions, Chives, and Shallots (Scallion in some countries). Garlic works best when it has been chopped up or crushed or minced and left for a few minutes. This is because that within Garlic is a Sulphur compound called Allin. However, when you chop, crush or mince garlic this compound becomes Allicin. It is the enzymes within Garlic that create the healthy and many medical benefits Ancient healers and current science have known to exist. This is also another reason why it is best to use garlic in this way when cooking. Just chop or crush the garlic first, give it about 10 mins for the allicin to become active before adding it to your dish or food. Note that the longer garlic is cooked the less of its qualities will be of benefit regarding health. Therefore, if you can add it towards the end, you will get the maximum taste, along with gaining the benefits with its amazing properties beneficial to your health. Not only, does this Sulphur compound create that garlic aroma or smell (depending on who is sniffing)? The very same compound is responsible for the many health and medical benefits that could potentially save your life. Besides, you can have various options that can hide or mask the smell away from others. Parsley is great to have for this, so is Listerine, or have a glass of milk and a few others choices, but the first two options are the best. The Egyptians, Greeks, Romans and Chinese are some of the civilisations of old that have used Garlic for health and healing. Here is (which has been proven and accepted by Modern Science) what the Ancients have already known just not with the technical details. 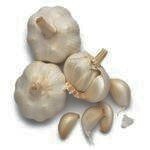 Here is a list of some of the Vitamins & Minerals found in this humble bulb called Garlic. As you can see from the chart, the humble clove of garlic pack a punch on the nutritional side and then some. Two awesome properties of garlic; is the antibiotic and antiviral benefits that give great support to those wishing to fight off that dreaded cold and those irritating coughs that follow. Garlic has always been known to help support the respiratory functions by helping to reduce the infections present. This is great news not only for those suffering from colds and flu by highly beneficial in helping to treat those suffering from Asthma and bronchitis. But don’t wait till you get a cold, regular use of garlic will help to strengthen the immune system so you don’t need to face those issues later. One of the best ways to do this is to have at least one clove of raw Garlic and best on an empty stomach either first thing in the morning or even just before you go to bed. However, morning might be the better option, as the stomach and intestinal have had a chance to work throughout the night as your body has rested. It is best to give an hour before having some form of solid meal, let the allicin perform its functions within the intestinal tract before the rest of the food comes into play. Chop or mince up the garlic, allow around 10 – 15 minutes. The reason for this time is to allow the enzymes to activate at its fullest potential. To avoid any aftertaste or for some may feel a burning sensation in the throat, you can add some yoghurt, or add a teaspoon of extra virgin olive oil as the oil will help to slide down the throat much easier. This will also help to take some of the taste of raw garlic away as well. If you do not like to add oil, then try honey (which is also a great healing property itself). For some, this helps to neutralise the smell. 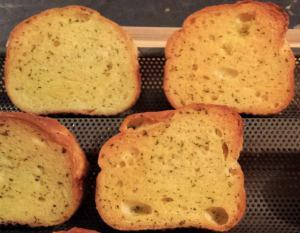 How about making your own Garlic bread slices. That way it is fresh and you know exactly what has been added plus you made it yourself so it will always taste great. What about the Garlic Breath? Guess what Listerine does a great job with that, so does having some parsley. You can also take a couple of peppermints, which is also soothing to the stomach. Another option is to take some Garlic supplements if you do not like the taste of Raw Garlic or the effects of garlic breath. One piece of advice I found personally, as I love Garlic. (After all, European blood is in me). There is a great difference between chopping garlic and that of mincing garlic. When chopped, most of the juices from the garlic tend to remain on the chopping board so much is lost. While mincing the juices still remain with the garlic and as such, there is a much more powerful taste, which if you are not used to it can give you a slightly strong burning sensation that you would have with chopped garlic especially on your tongue. Don’t worry, having it with a slice of bread of a cracker also helps sort out that issue. One of the world’s biggest killers in health is that of cardiovascular diseases such as strokes and heart attacks. One of the main reasons is that clots forms within the artery walls that as it remains untreated will block and stop to flow of blood to the heart. In turn, a major bad side effect is hypertension or High blood pressure which again if not treated at its worse, death can result from the many issues or combinations such difficult moments. So taking care of your blood pressure and ensuring that your blood flow is running at optimum levels with no blockages within the arterial walls anywhere in your body, not just the heart. In a study, garlic extract was found to be effective at reducing blood pressure and can also be just as beneficial if not more than taking drugs that are designed to reduce the blood pressure. 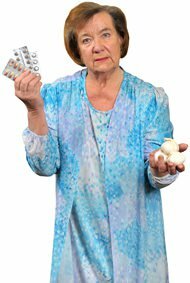 I do not advocate replacing garlic for any medication should you be taking for your health. Always consult your doctor for professional medical advice. Again, by taking garlic on a regular basis you are not only working on the immune system as stated for to fight against issue within the respiratory stages but also internally within the blood circulatory systems as well. Partly mention above, Garlic can help to reduce Cholesterol levels as well but the great thing about this is that it lowers the bad cholesterol while maintaining or even raising the good cholesterol levels. A Great Win-Win situation where Cholesterol is concerned. If not taken care of this could become a high-risk factor for heart-related issues along with strokes. You may find that taking supplement may require higher doses than compared to taking raw garlic as described above. The antioxidants found in Garlic have shown to help work against oxidative damage by working against the free radicals that contribute to the ageing process and to the cognitive functions of the brain. In doing so, Garlic can help to reduce the risk of Alzheimer’s disease and dementia. It cannot reverse the condition but it can help to reduce and perhaps even slow down the process during those difficult struggles in life. More studies are being down but this looks highly promising and who knows what options can be taken to maybe one-day stop these condition in its tracks. The sulphur compounds found in garlic have shown to protect against organ damage resulting from any heavy metal toxicity when taken in high doses. Again, such issues should be in consultation with a medical professional not just on hearsay. This is great news from those suffering higher lead levels in the body. A clinical study showed that garlic helped to reduced lead levels in the blood by around the 19 – 20% along with helping to reduce many symptoms people suffered such as headaches and blood pressure. We already know that garlic is great to include in your culinary dishes for the enhancement with the taste of foods but now we become more aware of the many great health and medical benefits that garlic has to offer. I would be most interested in finding out how garlic has been of benefit to you and let us know the different ways that you may be taking Garlic be it with some great food recipes or just for your health. Remember; your help and support will help others to benefit in life. Let me know in the comments section below with what methods you have tried and preferred. It would be great to know how it works for people trying different methods. So drop a comment or two below. What a great way this could be, you never know your idea could save or improve a person’s health and ultimately their life.